Paul Ehrismann posts some very interesting back-in-the-Westport-day photos on Facebook. I have no idea where he gets them. I can identify most of them — sometimes easily, sometimes with a bit of thinking. But this one’s got me stumped. There was not a lot of traffic back in 1930. There was a lot of open space. There were a lot of billboards. Beyond that, I don’t have a clue what I’m looking at. If you think you know where this photo was taken, click “Comments” below. Bonus points if you know the car. This entry was posted in Friday Flashback and tagged Paul Ehrismann. Bookmark the permalink. Probably the Post Road, right? Perhaps heading from where Whole Foods is now towards downtown? No idea where, but looks like a 1930 – 31 Model “A” Ford. I’m also guessing Greens Farms Rd, but maybe at the corner of Morningside looking west. I wonder if this a view of the Post Road as if u were standing in front of Trader Joe’s looking north? The hill on the left is recognizable. This looks like the entrance to Merritt exit 41 by Red Barn (on right). According to Wickepedia, the Merritt Parkway opened in 1938. I think its a Ford Model ! I agree with Joan Nevin. The billboards don’t make sense elsewhere. That tiny sign appears to have a J on it, and I wonder what that could mean. The other billboards are hard to read. I can make out Oil Filters on one of them. I’d guess Post Road West, looking East, toward the curve where Burr Road intersects the Post Road on the right. I am guessing it is near the Post Road and the intersection of Compo Road. I kinda feel like it’s North Ave., viewed as if coming up from Long Lots. The billboards wouldn’t necessarily make sense there though … but that’s the first impression that I got anyway. I’m with Mom. It seems like Nyala farms. 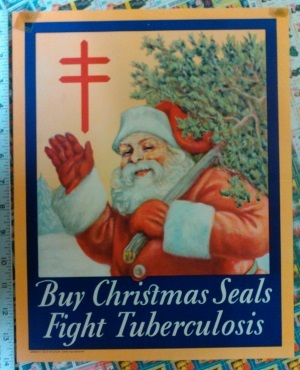 The large right-hand billboad depicts the Christmas seal campaign logo (cross with a double crossbar, with Santa on the right). Date the seal and you will have another clue. Kings Highway School on a late Autumn afternoon. My second time guessing where this picture was taken – my guess is looking east on the Post Road (or should I say State Street, given the period) at the intersection with Myrtle Ave – so that would be the hill where Saugatuck Congregational Church now stands on the left. automobile may be a 1930 Packard Sedan based on the front grill. From the above, which I found in a court case between the town and the billboard company known as Murphy, Inc. of Bridgeport, as of 1930,14 of Westport’s 15 billboards were located on “State Street,” and only between downtown Westport and the Fairfield border. PS – The court found Westport’s regulation to be “unreasonable, arbitrary and void” and struck it down in this 1943 decision. Which court? US Supreme or a lesser one?! lol – this was decided by the Connecticut Superior Court, a lesser court than the US Sup Ct to be sure but the court with jurisdiction over Westport’s P&Z activities. Elaine, you are a sleuth of the highest sort! Fascinating history; great find. And a plaintiff in this case was, I believe, went on to become the builder/proprietor of the bowling alley on the Post Road. I think it looks like Weston Road heading towards the light by Weston Gardens. These 3 billboards aren’t outside Ebbing, MO, are they? Looks Like Wakeman Field – However, I need new specs. It is very Gatsby-esque. I say Greens Farms area. Maybe Greens Farms Rd near Nyala Farms. It DOES feel very “gatsby-esque”! I got that vibe too, but couldn’t quite put a finger on it. Feeling “Wilson’s” garage, and the Orwellian 1984-esque eyeglasses billboard, from this pic. Looks like the entrance to I-95 south at exit 17 as you approach it driving south on Riverside. Paul really comes up with fantastic pictures. The car: My best guess, a Model A Ford Roadster. Someone said a Ford with a rumble seat. I think all the Model A’s with rumble seats were Roadsters but I could be wrong. Ask a former Downshifter…My best guess as to place would be the Post Road. The hill and corner just north of where Trader Joes is. I like this. The topography fits that description of where the Human Society now sits. Winslow Park – Compo North near the intersection of the Post Road. My first and final thought was/is the Post Road looking east just before the “Humane Society” hill just after the Compo Shopping Center. East Main would be just out of the frame on the left side of picture. Billboard evidence offered above clinches the location east of downtown and no other likely hills in my opinion exist along that route. Ok. I’m going to take a second stab at this…Post rd, looking east just east of where Dragone’s is now. While the stone wall indicates a single property owner (with some means) I would doubt Bedford had billboards on his farm. And without 95, there wouldn’t be enough traffic to merit them. So I’d guess State Street/Post Road would be the only place that had billboards. Part of that stone wall might still be around. The shadows are pretty long, indicating a rising or setting sun. I’d guess the latter, so it would be taken looking south or southeast. Did all roads have telephone poles like that in the 30’s? Kings Highway school is just on the right; (out of the photo). The photographer is facing north on the Post Road. Mediplex will be built in the future at the top of the hill on the right. Isn’t the hill across from. Mediplex much taller? And wasn’t there a lot of development on it (including a cat house)?? My husband, John (sam) Nevin, insists this is driving northeast on post road by current Kinfs Hogjway zelementary school!. Please let us know! I wish I knew, Joan. As my story says, I have no idea where this is. Consensus seems to be Post Road East, looking east by what is now the Humane Society. In 2nd place is Post Road West, looking east by what most recently was Dragone Classic Autos. The power/telephone poles are on the proper side of the road, further supporting Post Rd West looking East near KHS, with Burr Road on the right at the top of the hill. The shadows suggest that the car is driving westward so the view is to the east. I’m with Jack Whittle: State St. looking east where the church is now. Compo shopping center going toward Fairfield, heading up the hill to the curve to where the fire house is now. The hill on the left would be where the ASPCA is now. I think the car is driving East and the camera is pointed West. The hill in the photo is 500 Post Rd East (South side of the road), across the street from the Humane Society. (Probably originally all the same hill, cut in half by the Post Road early on.) If the camera is looking west, the leftward curve in the road behind the car matches maps of this spot. In the early 70s, I visited that location when some friends rented the old house which originally stood there, on a hill. The hill was higher then, and has been flattened some to accommodate the larger building which now sits at the site. It overlooked an IHOP on the same side of the street (to the left in the picture). The IHOP building is still there, but appears now to be occupied by a Nail Spa. In Google aerial photos, you can still see the distinctive IHOP blue roof. I say either Post Road East across from the Humane Society (before there was any building on the opposite side, and before “Tony’s of 52nd Street”? – or Greens Farm Road, on the opposite side from Nyala Farm. There is a print of a Steven Dohanos black and white drawing of a convertible car driving along what looks to me like the same road, just at the brow of the hill, with a couple in it; it’s a Model A Ford, I think, and all the cars (more 30’s and 40’s vintage) are backed up behind it. Hey Mike! You lived in this area – any ideas on this? I think the topography is not so much like the area many of you are suggesting. I believe this is more indicative of the eastern end of the post road in the Greens Farms area looking east in the morning. Perhaps Rippie’s farm and points east. Telephone poles are still on the right. The car appears to be a 1931 Model-A Ford coupe. 1930 models had a more reflective radiator shell. There is evidence of what might be cowl lights to indicate it was a DeLuxe model. Coupes were very popular at the time and sold for under $500. Popular with traveling salesmen, there were over 375,000 Coupes produced between 1930 and 31 with fewer sold in ’31 as our country entered the Great Depression.